Current insights, objective advice, and resources for service and support professionals, given in the spirit of sharing information. We have made changes to our website, so if you haven't been there for awhile, please check it out. Visit www.hthts.com. I hope you find our new site clean, easy to navigate and containing useful content. We are adding more information weekly. Our goal is to create a repository of resources and information that will contribute to your personal and professional goals. My parents taught me about sharing with others and having a kind word for others at a young age. When someone needed clothing, help with their family issues, or a place to stay, we always provided whatever we could. When the kids wouldn't play with certain children in school, would say mean things to them, and not invite them to birthday parties, they taught me to treat them otherwise, though I slipped up from time to time. We invited the kids to come play at our house, attend the birthday parties and other social gatherings, sometimes against my will. My parents taught me that they were good people who deserved to be treated kindly and were people who had feelings too. It was hard not to join the other kids and not tease our classmates or say mean things behind their backs. I was no better at times. I'm sorry for that now. I witnessed a case in a help desk not too long ago where people forgot about other's feelings. A gentleman was not coming to work regularly, often out ill. He was teased, notes were left on his chair, and people would speak cruelly to him. These people were adults in a professional environment who didn't remember how bad it feels to be hurt. It is surprising to see this sort of behavior even today but unfortunately it still happens. Words are harsh and hurt others deeply. Jack died of AIDS, 30 days after I met him. No one had known of his condition. Share a kind word with someone today and make a difference in their life. P.S. If you have resources, favorite books, an article or personal story to share, please email me at mailto:Ivy@hthts.com. We will share your story and resources with our readers in future issues and on our website. Are You Doing the Blog Yet? Blogging seems to be the buzz word of the year. And did you know that the topic most blogged is technology? For those who are unfamiliar with blogging, it is a historical log of communications. The simplest way to think of blogging is a long email with a lot of people adding their thoughts, that you are now making available for anyone in the world to read. Some people like to keep their daily diary online for everyone to read. Not my idea of something I would want to read, but OK, we can go with it. Others use it for professional exchanges. Newsfeeds, job openings, events and much more are published in Blogs today. The accounts of the 9/11 disaster has drawn millions of readers worldwide. People who lost a loved one, witnessed the tragedy, or offered help in some way, have contributed their own stories to the Blog. You can find the Blog, Voices: Stories from 9/11 and Beyond at http://www.asmallvictory.net/photoblog/. People have been "blogging" since the mainframe days. We just didn't call it that and it wasn't done on the Internet. The next formal version of blogging, when technology moved to the client server world, was called collaboration software. It is actually a form of content management. Whatever you want to call it, it can be an invaluable tool for sharing and disseminating information. There are Audio Bloggers and Photo Bloggers too. For people who want to share their thoughts before they get back to a computer, they can call a phone number and record their message and have it immediately downloaded to their Blog. It is important to be cautious if you get into blogging though. “Comment SPAM” has become a big issue. People can learn more about you than you want them to know. To get more information visit http://codex.wordpress.org/Combat_Comment_Spam. Also know that you can set up your blog in a very controlled environment. You can define passwords, access rights, who can delete items, who can add and much more. The free Bloggers have few controls on them, but the more advanced services offer many capabilities and controls. Check our website for more Blog resources and to participate in our Blog. One of the most difficult things for anyone to endure is change. Some of us thrive on it while others avoid it like the plague. The win is to make change safe and ensure people can be successful during and after the change. During my tenure at U S West Communications, they gave me the title and function of Change Agent. My first job was a telephone operator on the last cord board in the United States. My first assignment as a change agent was to help people, who had done the same job for over 20, 30, even 40 years, change their way of doing their job. They had to switch from paper and pencil to using a computer to handle calls. The emotional drain on many was too much and a good number left. Some cried. Others were angry. Some just did what had to be done, though they resisted the change. But many embraced it. The change was inevitable and beneficial to the company. Everyone understood that. Their fear was that they wouldn't be able to learn the new technology. They were afraid of failure. We had to address their fear and make them safe. The training I received to be a change agent included years of psychology as changed ensued in the telephone company. Divestiture guaranteed constant change for us. There are many tools and programs available to help people respond, embrace and become champions of change. ADKAR is a tool that can help you understand where people are in the change process. You will likely find this a very useful model. There is a wealth of information about ADKAR and change management at http://www.change-management.com/tutorial-adkar-overview.htm. They offer free tele-seminars and other resources. This site is worth a visit. Embrace change, it may be the best thing that happens to you personally and professionally. Eliminate the fear of failure and become a champion of change. "The better measurement is the call quality in combination with these two components. If you want your team to up-sell or cross-sell, offer high first call resolutions, and build customer loyalty, getting off the call as fast as possible is not the answer. If your reps and agents are motivated to handle an extremely high volume of calls with particularly short call durations, how could they possibly offer the desired level of service?" A few good books to read on the topic of change management are listed here. There are many other suggested readings on our website at www.hthts.com/booklist.htm. Some email services require you to have our email address in your contact list or 'White List' of emails you will accept. Please put our email address: ivy@hthts.com, solutions@hthts.com, and the hthts.com domain on your accepted list. Subscribe: Simply reply to this copy with subscribe in the subject line. Unsubscribe: Reply with unsubscribe on the subject line. We hope you enjoyed this edition of eSharings. We welcome your ideas and contributions to our newsletter, published worldwide. Please email us future topics you want to know more about, ask questions or share resources and ideas. Feel free to reprint this newsletter in its entirety with our copyright information intact. We love to see our information shared with others. eSharings will contain links to sites on the Internet, which are owned and operated by third parties. High Tech High Touch Solutions, Inc.™ is not responsible for the content of any such third-party site. This is an incredible book. We know you will find it a valuable addition to your personal library. Order now! 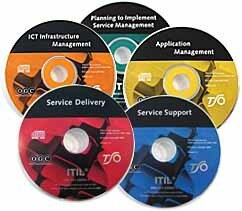 This collection encompasses the complete ITIL Library authored by The Office of Government Commerce (OGC). It consists of 7 publications which represents the latest revisions and re-write of the original 40 volume library.